Pine trees susceptible include Bishop, eastern white, loblolly, longleaf, Monterey, sand, Scots, shortleaf, slash, Table Mountain, and Virginia pines. Regions affected include, Southeastern United States, California, Texas. Factors that contribute are, Physical wounding (including lawn mowers, weed-eaters, and climbing spurs), insects (tip moth, midge, bark beetles, deodar weevil) which may serve as vectors, and other fungus infections (eg. gall rust). Symptoms of pine pitch canker include, resin-soaked lesions around wounds, girdling twigs and small branches; developing into perennial cankers on trunks and large branches. Bark remains on canker faces. Diseased bark reddish-brown; underlying sapwood is yellow-brown and impregnated with resin. 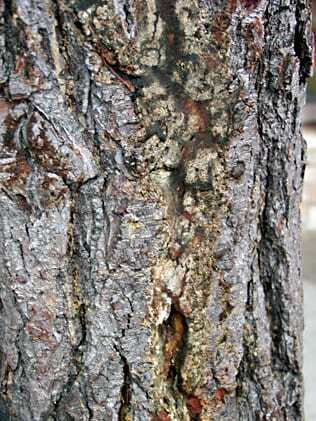 Resin exudes from lesions and cankers to run down bark or onto foliage below. Shoot dieback, tip wilting, and branch incurving (“shepherd’s crook”) follow. Macroconidia produced on small, cushion-like, salmon-colored sporodochia (approximately 1/16 in. wide and 1/32 in. high) on dead shoots and twigs, generally on needle fascicle scars. They are present all year, but most evident in autumn and winter. Conidia are colorless, having from 1 – 4 cells, curved, elongate, and pointed; disseminated by wind, insects, and splashing water throughout the year.